This is it folks, the last month of the year! If you (or a loved one) are celebrating a birthday this month, then some December birthstone jewelry is in order. Lucky for you, you have two glorious stones to choose from: turquoise and tanzanite. Both blue, both beautiful, and both perfect for jewelry, these stunning birthstones will brighten up even the coldest of winter days. Read on to find some perfect December birthstone pieces to add to your collection. From the fashionable Italian jewelry brand, Ippolita, comes this beautiful Ippolita Station 18k Yellow Gold and Turquoise Necklace. Flaunting gorgeous greenish turquoise stones this long 18k yellow gold chain can be worn a myriad of ways depending on your mood. Whether with a classic white shirt or a glamorous black cocktail dress, this Ippolita designer jewelry turquoise necklace is a fabulous way to wear one of December’s birthstones. 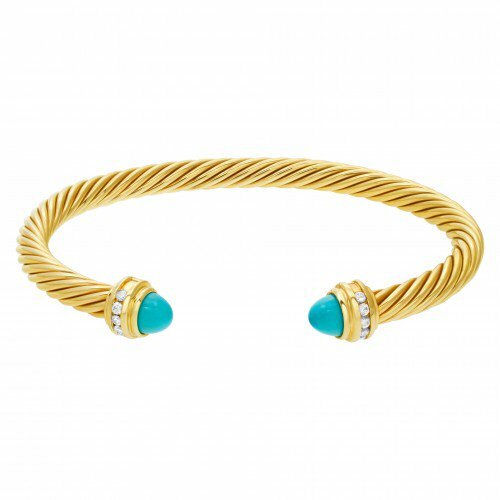 Yet another designer jewelry offering, this David Yurman 18k Yellow Gold Diamond and Turquoise Cable Bracelet brings together precious gold, dazzling diamonds, and fresh turquoise. Featuring David Yurman’s iconic cable design, the sculptural yellow gold bangle is accented with a duo of turquoise stones at the tips, joined by a row of gleaming diamonds for added luxuriousness. Precious in nature yet, easy to wear daily, this David Yurman December birthstone bracelet can be worn alone or stacked with other bangles and bracelets for a serious style statement. Among the various turquoise shades available, “Persian blue” is the most coveted, characterized by its striking robin-blue hue. 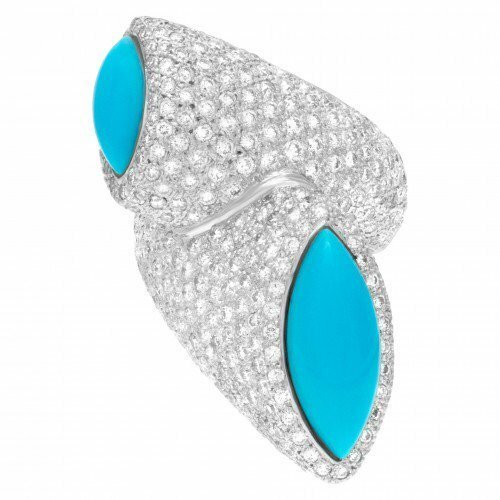 This dramatic diamond statement ring includes not one but two cabochon-cut Persian turquoise stones. With 420 full-cut diamonds weighing a total of 10.50 carats, two large turquoise stones, all set into 18k white gold, this Persian Turquoise Diamond Statement Ring is a magnificent way to show off your December birthstone. If you prefer Tanzanite over turquoise as your December birthstone (or like to have both in your jewelry box for options) then feast your eyes on this AGA-Certified Tanzanite and Diamond Ring. 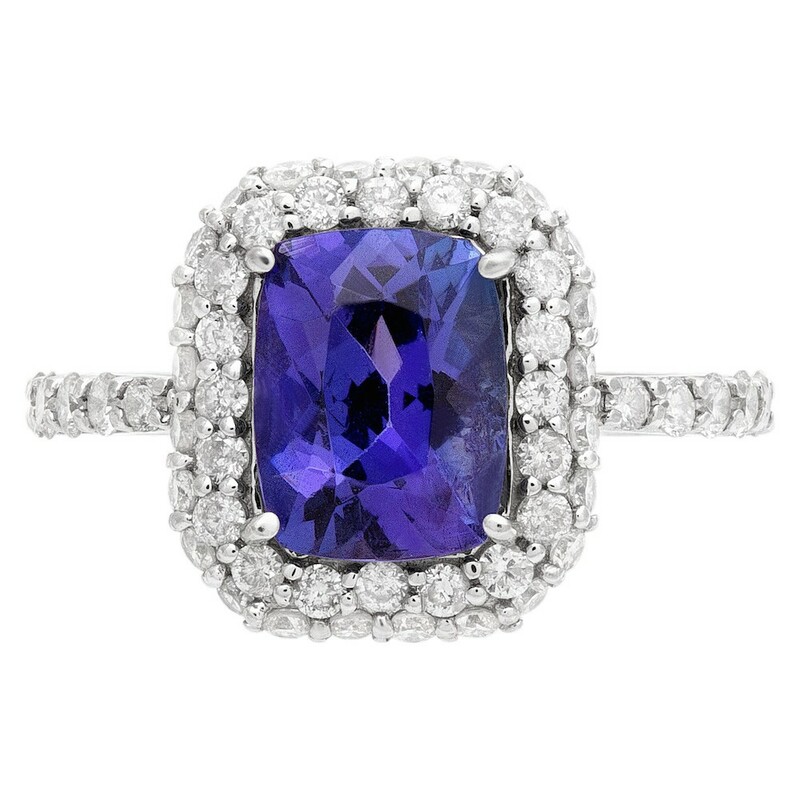 At the heart of the ring sits a 2.06-carat blue cushion-cut Tanzanite stone set into 14k white gold and surrounded by a double diamond halo. Furthermore, the shank is further embellished with diamonds for a total diamond weight of 0.78 carats. 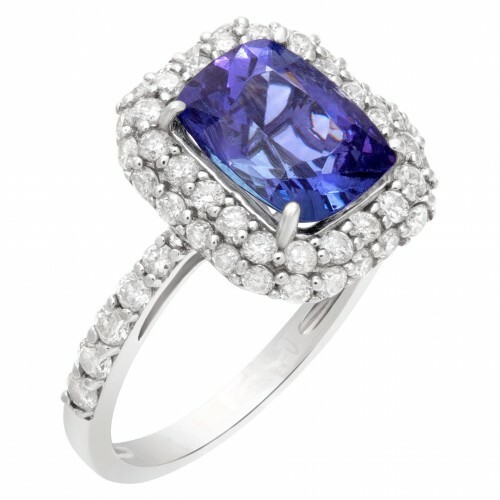 A ravishing fine jewelry ring that celebrates a December birthstone splendidly. For a spectacular way to wear the December birthstone, behold this Yellow Gold Tanzanite and Diamond Ring with an oversized 25-carat rich blue tanzanite. 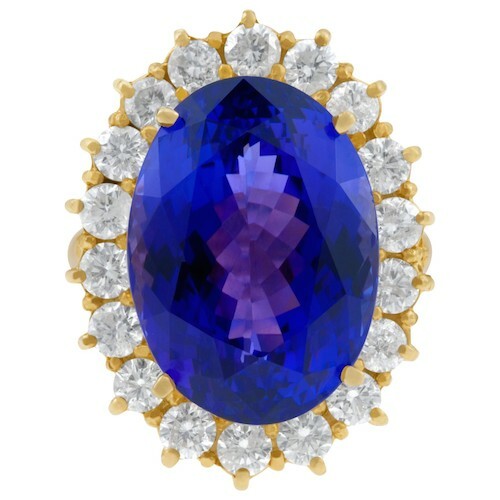 Surrounding the large oval-cut tanzanite stone are 18 diamonds, all set into yellow gold. When only the best will do, this show-stopping cocktail ring–that’s both classic in style, yet ultra impressive thanks to its gem size–certainly fits the bill. Whether you go for turquoise or tanzanite December birthstone jewelry, both these stones are attractive in their own way. Feeling blue has never looked so good!